Chopped is a cooking competition show that is all about skill, speed and creativity. Each week, four chefs compete before a panel of expert judges and turn baskets of mystery ingredients into an extraordinary three-course meal. Course by course, the chefs will be "chopped" from the competition until only one winner remains. With only seconds to plan and 30 minutes to cook an amazing course with the basket of mystery ingredients given to them moments before the clock starts ticking, the pressure is on! Once the contestants complete their dishes, they're put on the chopping block where three judges make the final call, based on presentation, taste and creativity! This season of Chopped is set to be more exhilarating than ever. 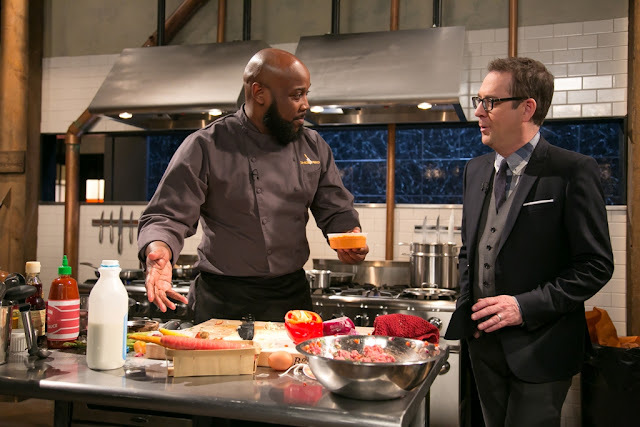 Featuring a 4-part All-Star tournament, Chopped champions Madison Cowan, Eric Greenspan, Brian Malarkey and Art Smith converge yet again in the Chopped kitchen for the grand prize of $75,000. In the first round, a slimy ingredient provokes some disgusted reactions from the competitors and judges. In the entree round, a beautiful fish in the basket leads the chefs to make some surprising mistakes. And when the two finalists go in totally different directions with their desserts, it's up in the air which approach will be more pleasing to the judges. Host Ted Allen leads this high-energy, high-pressure show that will have viewers rooting for a winner and cheering for the losers. Chopped is a game of passion, expertise and skill — and in the end, only one chef will survive the chopping block. Who will make the cut? The answer is on Chopped! Catch the all-new season of Chopped on Food Network, available on SkyCable Channel 345 HD/68 SD, Destiny Cable Channel 68 and Cignal Channel 100, premiering on 21 July, every Thursday at 10.00pm.